This morning, shortly after I woke, we reached our first drill site (WLRIS-06A). There was a flurry of activity, the dynamic positioning thrusters were deployed, beacons dropped to the seafloor and the crew started assembling and lowering the drill pipe, section by section, through 3700m of water to the seafloor. Once the drill bit reaches the sediment the intention is to core down through 500m of sediment. So for Expedition 318 this is our first attempt to travel back through time, to recover sediments (and the climate stories they contain) deposited 40 million years ago, in the “greenhouse world” of the Eocene period. 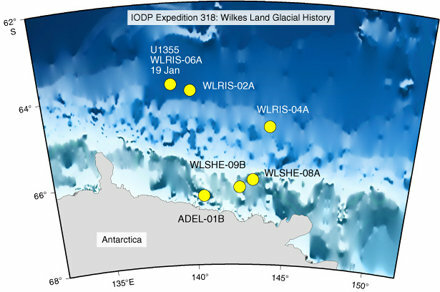 This first site was actually planned for later in the cruise, but a decision was taken yesterday to drill it first, as our intended site (WLRIS-09B) had too much ice cover. So we turned back and sailed to the current site through a flotilla of ice-bergs. Yesterday afternoon, they came looming out of the mist in various forms, one to three mile wide tabular slabs, wedges and domes. Below are Christina Riesselman’s photos of the bergs and of the ships radar screen: the ship is the green dot, the straight green line is our planned course and the yellow blobs are the ice-bergs. – What’s the food like? : Chicken madras for breakfast – get in! (working on shifts gives us some unconventional breakfasts). – What’s on lab stereo? : The strokes – Is this it?, The Smiths – The Queen is Dead and Neil Young – Ragged Glory and Best of Bowie.